Christmas Report – Part 1! Oh my! It’s been over a week since I wrote last. Ops! I’d had such great plans to catch up on my blogging during this week but my family took all my time. I figure that considering the holidays are about spending time with family that I shouldn’t worry about it too much. 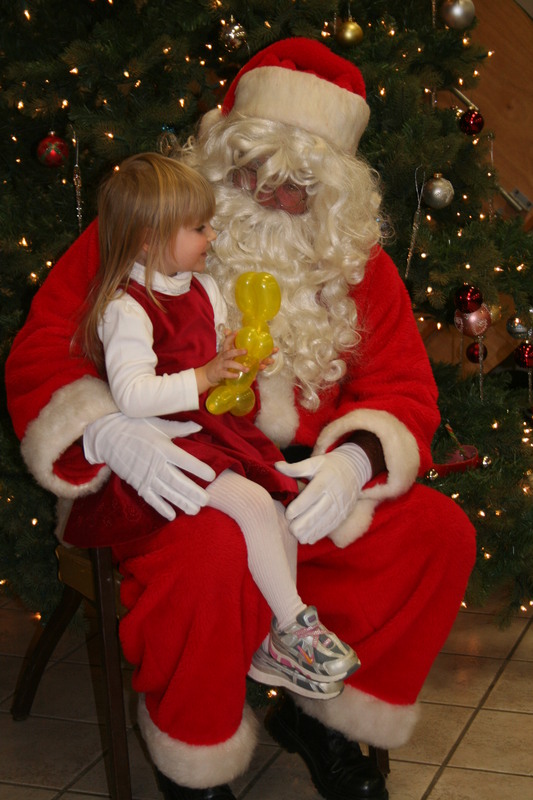 Earlier in December Steve took the girls’ to his dad’s work holiday party where they got to see Santa. 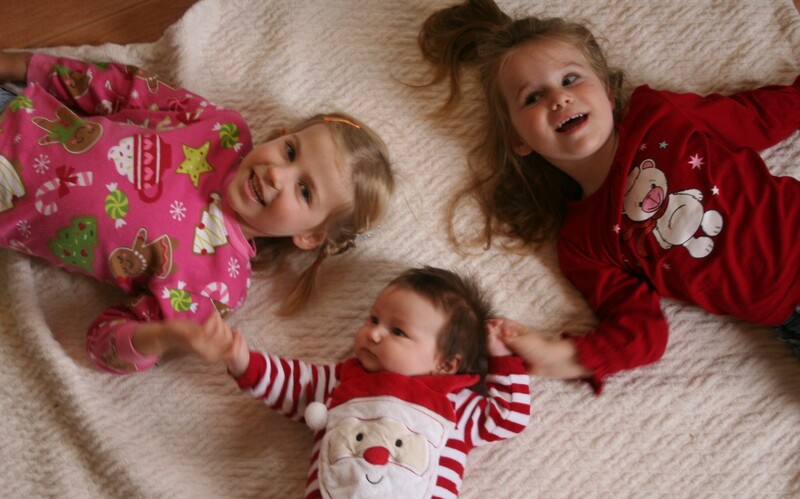 Here are the photos of them sitting on and refusing to sit on Santa’s lap. 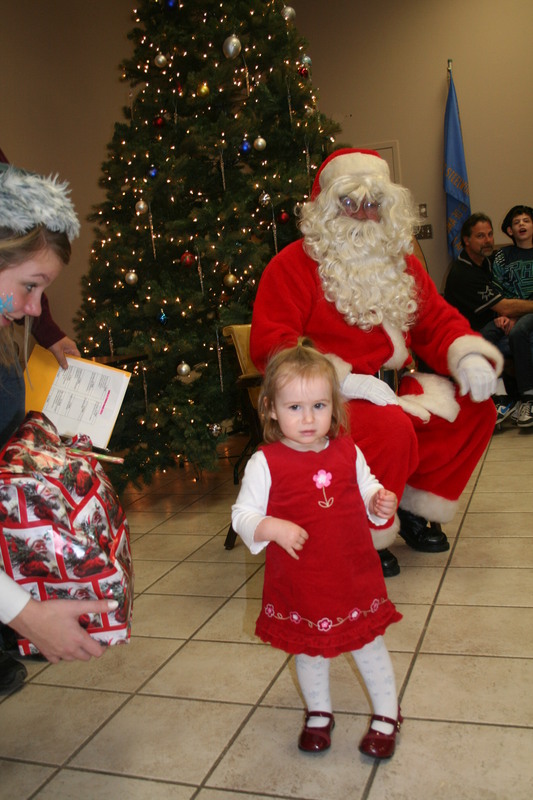 Lillian sitting on Santa’s lap to get her toy. Katrina staying away from that creepy guy in an outfit that matches hers. My birthday was fantastic. Steve and I had a romantic dinner, and after that went to see the Hobbit. My mom was wonderful to come up a few days before Christmas since my birthday is so close to Christmas, and watched the girls for me. We then spent some time over the holiday with my mother and step-father, who stayed until after lunch on Christmas day. My father-in-law and brother-in-law came over for Christmas eve dinner. We all enjoyed the ham very much. Steve requested a ham for Christmas after I said I would only make turkey on Thanksgiving or Christmas not both. I managed to provide a yummy component to the dinner every person who attended, and I worked super hard to make it special for everyone. Christmas morning was a bit busy. The girls who had been sleeping in until after 7am were up at 5:45am and 6:30am. So we were having a lot of coffee and eventually just sent Lillian into the basement to fetch her Oma and Grandpa so we could get the presents underway. Last year Lillian didn’t want to open many but this year she was a pro and so was Katrina. She did several funny things on Christmas. First, on Christmas eve while Steve was getting everyone dressed upstairs, he took the girls to help him pick out a shirt. He didn’t give any thought to the ripping sound he heard while Lillian was picking his shirt, but when he suddenly realized what the sound meant and looked down, Katrina had already ripped open a whole present. Lucky for him it was hers. The other funny thing was on Christmas morning. While we were making coffee and Lillian was getting her Oma and Grandpa from the basement, Katrina just wandered over to the tree and ate Santa’s leftover cookies. Steve got to her before she could drink the milk, but she ate one whole cookie and the other one I found later in the doll house. Silly baby! 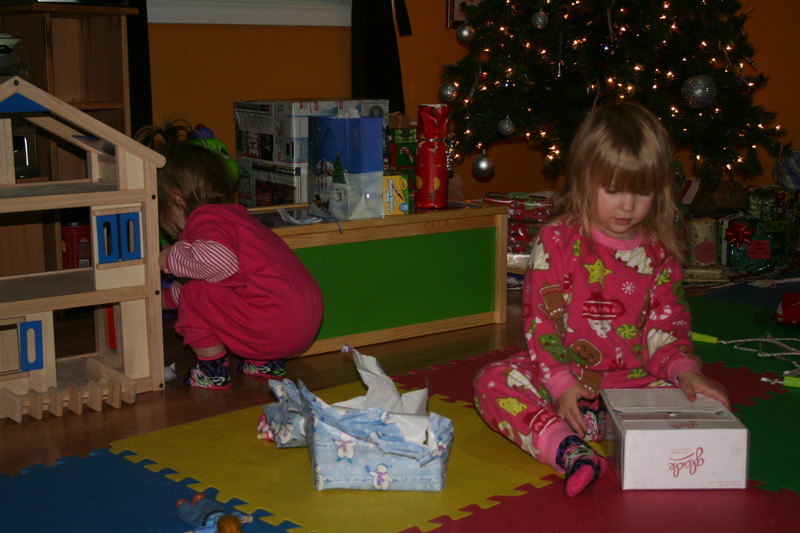 The girls on Christmas morning. Possibly when Katrina was hiding the cookie in the house. Finally, the girls spent the rest of the day having a good time with their new toys and playing with daddy and mommy. And don’t worry part II of this post will have a lot more photos of them playing over the last few days post Christmas. But right now WordPress is being seriously stupid and I can’t get it to do what I want and I give up for tonight! 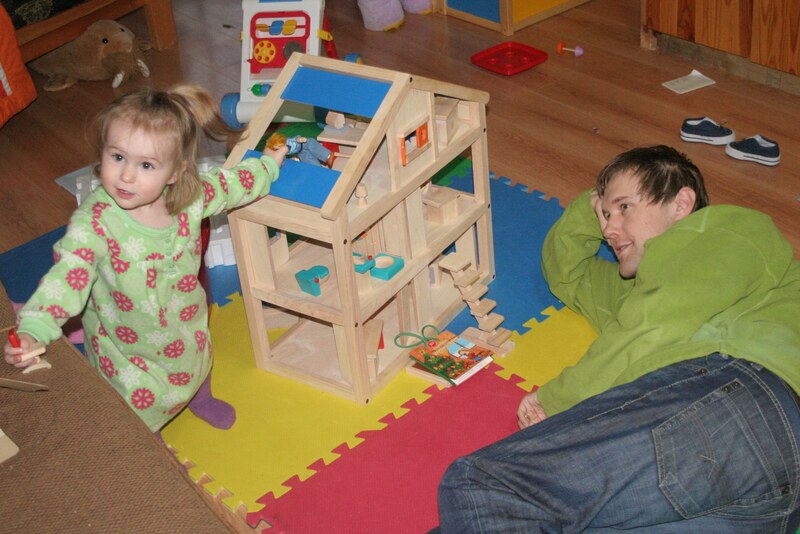 Katrina playing with daddy and her doll house. Notice that she is holding the ‘daddy’ doll, the office chair and the office desk is visible through the roof. ← Day 9: The Races of 2013.